I have been off work for a couple of days with flu so it gave me a chance to pick up a pencil again. 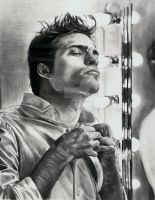 the result, a new drawing of Robert Pattinson. I was impatient for the forth film...so i read the book, i wouldnt say i was a twilight super fan but i do enjoy the books and the films, what with my love of all things supernatural.